Over the weekend a lot of tech bloggers got into a tizzy over a suggestion that Twitter search should rank Tweets by authority, with Tweets from people who have the most followers coming up first. Some bloggers quickly objected that this was somehow undemocratic or would give spammers more of an incentive to trick people into following them, and thus would be easy to game. One developer went ahead and created exactly that search experience with Twitority anyway. (Update: Make that two, check out Twithority also). While others didn’t understand what the big deal was in the first place because their relatives in Scranton have never heard of Twitter (sigh). One thing that is clear is that there needs to be a better way to filter Twitter (which is a finalist for a Crunchies Award this year) as it grows into a broader public communications and publishing system. I like to think of Twitter as public IM. But with possibly more than one billion Tweets out there, how do you know which ones to pay attention to? What is the best way to measure the authority of a Tweet (and, thus, where it should rank as a Twitter search result)? A better proxy for authority than the absolute number of followers someone has on Twitter may be how many times their messages get retweeted. Retweeting occurs when someone takes an original message on Twitter (a Tweet), sticks an “RT” in front of it, and spreads it further to their followers. It’s another way to separate some signal out of the cacophony of Twitter. These numbers are, of course, related because the more followers someone has, the more likely that one of their messages will be retweeted. But they are not exactly the same. For instance, here are the top 100 people on Twitter ranked by number of followers and here is another list ranked by the number of retweets. Guy Kawasaki is No. 1 on the Retweet list (his messages have been retweeted 335 times in the past week), and is No. 9 on the followers list (with 40,496 followers). Not surprisingly, he thinks looking at retweets is the way to go (so he tells me). The nice thing about retweets is that it offers a potential way to sort though not just people on Twitter, but their individual Tweets. An important Tweet that gets replicated around the world from someone with 5 followers or less (which is a third of all Twitterers), should have more authority than a Tweet from Kawasaki or Robert Scoble or even Barack Obama that has no impact. You could go even deeper than just the number of retweets a person has. An even better proxy might be the number of retweets per follower. Someone with a high ratio might be worth listening to more than someone with simply a lot of followers. 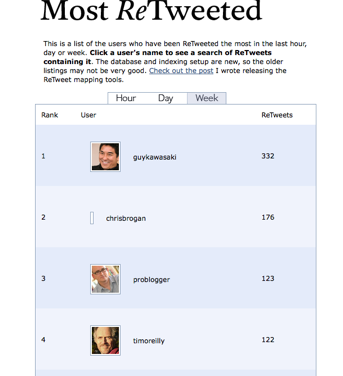 Looking at the propagation of retweets is also helpful. Dan Zarella, the man behind the retweet list, recently crunched some numbers and found that most retweets die after the second retweet. That is they get picked up by one follower and that’s it. Only 7.57 percent get retweeted again. But the retweeting rate then grows after that. He refers to it as the “depth” (See chart below). Messages that have ben retweeted three times have an 11.47 percent chance of being retweeted again. By the time a message has been retweeted five times, it has a 48.44 percent chance of being retweeted. I would love see all Tweets that have been retweeted three or more times, especially whenever I do a Twitter search. The problem with retweets I suspect is that not many people use them or even know what they are. What’s with all the abbreviated commands on Twitter, anyway? How hard would it be for Twitter to add a retweet button or link, at least as an option? (In fact, they should take the most popular commands and turn them into buttons—usage would skyrocket). Then, just as Webpages and Websites have different link authority, individual Tweets and Twitterers could gain retweet authority. A Website that gains link authority over time has an advantage over others, just as someone like Kawasaki has an advantage over other Twitterers by dint of how often his messages have been retweeted in the past.